I have to start my review with a confession: before two months ago I had never heard of the Broadway show Dear Evan Hansen. However, as soon as I finished this book I ran straight to iTunes and listened to the soundtrack with the original cast about a hundred times in a row. And obviously I need to see it live now! Today is going to be an amazing day and here is why: I have now read Dear Evan Hansen and am so thankful. Truly, this is one of those stories that will stick with you long after you close the book. Evan is a high schooler just trying to get through most days. He is a senior, mostly unsure of what he wants to do with his life and though his mother is trying as hard as she can, she isn’t around much. He sees a therapist that suggests he write letters to himself beginning with “Today is going to be an amazing day and here is why…”. But one day while printing his letter off in the computer lab it falls into the hands of a boy named Connor Murphy. What Evan doesn’t realize is this letter will completely change his life. I don’t want to say too much because I really feel this is a story you need to experience for yourself without knowing everything first. It is heartbreaking and touching. It will make you frustrated and bring you to tears. Give this one a read if YA contemporary is your thing and then go listen to the soundtrack so we can sing along together! 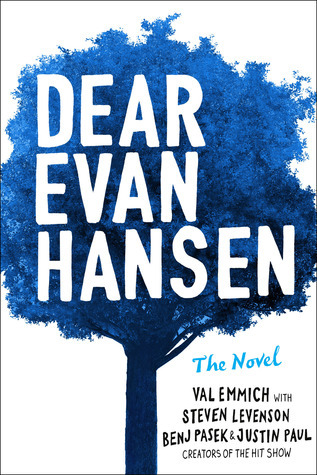 Synopsis: From the show’s creators comes the groundbreaking novel inspired by the Broadway smash hit Dear Evan Hansen. Big thank you to TheNovl for sending along an ARC of this gorgeous book for me to review!